Now that I'm doing a scene-to-scene structural ripoff of The Road Warrior (which is, incidentally, impossible to do and I have no idea how I'm going to deal with the compound or how the "feral kid" is now an android and the dude in the helicopter is now a witch, but you get the idea) I've been watching the movie again. And that picture is spectacularly well filmed. I mean the cinematography and the camera work are simply excellent. Unbelievable. But instead of the post-apocalyptic desert it's about this dude who's a super-enhanced human soldier. And he's been dumped off on the Earth after the alien apocalypse where there's just old war-machines running around the place. And he runs into a combat witch and eventually an android who, among some other people, are holding out in an industrial park in Jersey against the alien "bogies" which roam around trying to wipe out the last of humanity. How am I going to make these mechs work? And will the lead's servo-powered armor also be a rocket powered suit? Will he fly? How does that equate to Max's supercharged V8 interceptor? Will it be destroyed? Or should he have a bigger suit, one he steps into? What a pain in the tuchus that sounds like. And will you be able to see his face in the armor or will he be taking his helmet off all the damn time? Will the feral kid and the blonde woman be the same character in "Earthwar"? And will it all take place in Brooklyn? The feral kid is the cat Mel saves. Hmm... it's too bad Mel turned out to be such a douche. 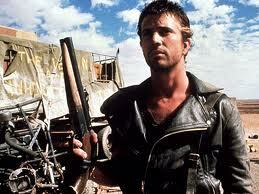 The problem with modeling a screenplay on The Road Warrior is that the picture is almost too perfect. Sure, you can see some tropes of Star Wars in it, and there's the general craziness of Australian mondo cinema, and of course the chase scene in Bullit. But our hero "John Keynes" (let's see how long that name will stick in the script) must certainly end up facing down a combat witch's crossbow, doesn't he? And the way Max loses the Interceptor always seemed to easy to me. I understand why he has to lose it but it's a bit like Han Solo losing the Millennium Falcon if it had just self-destructed. And I have zero idea of what the Starship Troopers equivalent of that would be. i've begun work on the combat witch. I'm thinking she's a cross between Zoe and River Tam from Firefly. Or, she's basically Mad Max but in female form. If she's a witch, can she only carry a crossbow? That would make her like a witch in the "His Dark Materials" books. oh, then never mind. i was imagining her as this war-torn cyborg torso with a tank-treaded lower half. we'll save it for some other character. i'll build it and you find a place for it. The Last of the Clonehunter Reviews?